Product #21294 | SKU TAA010CAN | 0.0 (no ratings yet) Thanks for your rating! 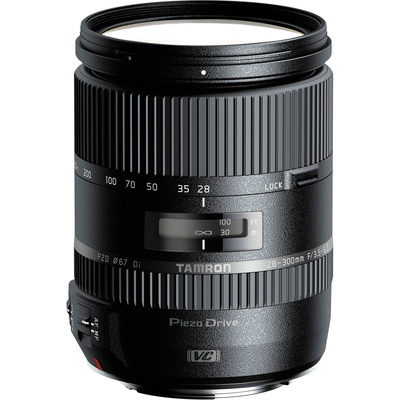 The Tamron 28-300mm f/3.5-6.3 Di VC PZD Lens for Canon is a wide-angle to telephoto zoom lens for Canon EF-mount full-frame and APS-C cameras. It provides users with an extremely versatile all-purpose lens in a compact design and on APS-C cameras it has a zoom range equivalent of 44.8-480mm. Also, it has an aperture range from f/3.5-6.3 to f/22-40 across the zoom range. The 28-300mm is also capable of decent macro capabilities with a reproduction ratio of 1:3.5 when zoomed in to 300mm. This is due to a minimum focus distance of 0.49 m. Also, for excellent image quality, numerous special glass elements are used in the lens design in addition to Broad-Band Anti-Reflection coatings. There are one Hybrid Aspherical element, three Moulded-Glass elements, four Low Dispersion elements, one Extra Refractive Index element, and one Ultra-Extra Refractive Index element. For general use, there is a Piezo Drive autofocus system which is powered by a fast and quiet standing-wave ultrasonic motor. This allows you to quickly achieve focus for sharp images. There is also Vibration Compensation which provides optical image stabilisation that reduces camera shake at slow shutter speeds and longer focal lengths. And, included with the lens are a flower-shaped lens hood as well as front and rear lens caps.